Yesterday (Wednesday) was a strange day - it was the time trial which was short and very wet, ending up at St Michael's Mount. As you may have noticed from my previous blog, my pen friend arrived at the finish. It was a surreal moment, but good. 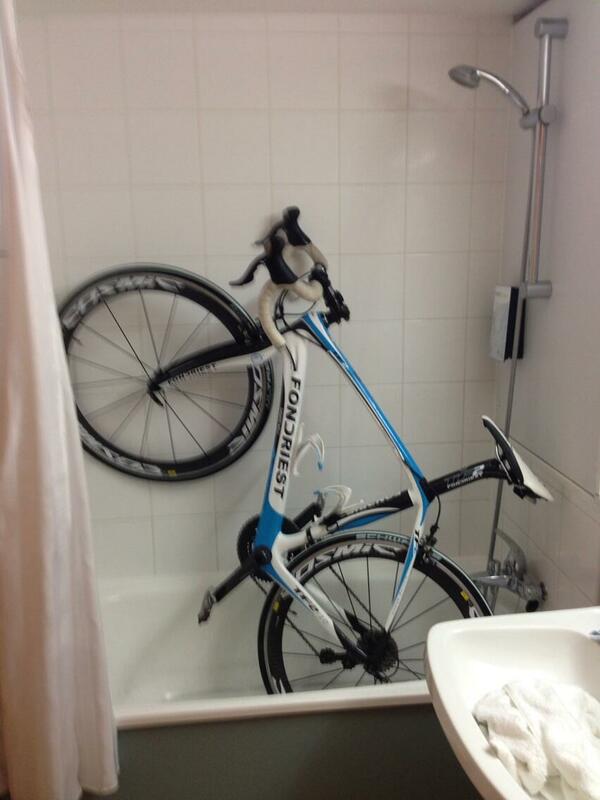 The rest of the day was quite a relaxed day - back to the hotel and cleaning bikes, here's how I managed to get the bike in shower. You should have seen the tide mark around the bath! Here's the highlight of the day - I emptied my whole kit bag, and sorted it out. It felt great. The last week had meant chucking things in the bag in order to get out on time each morning, so getting things organised felt really good. Stage 12 was long, flat, and to be fair not very exciting. Busy roads, long roads, and I mean really long roads. We started swerving around just to remember how to steer. Some were taking it steady - my aim was just to get it done. So we got in a group of 8 and put the pressure on to get home ASAP. Even though it was a flat stage we did over 1,600 metres of climbing, and with 130 miles in length, it was still a 4.30pm finish. Even with some big stages to come, in true style we went for a race finish. Stupid idea, but hey, first back gets first massage. Getting off the bike my phone rang, and within seconds I was on the BBC radio, being interviewed about meeting my pen friend yesterday. Surreal to think I'm stood in a car park, with cyclists, masseurs, bare cheeks and it's all being broadcast live. A couple of thank you's to the sponsors of stage 11 and 12 - sitecore and cact.us - I really appreciate your support.